The Climate of India is Diverse from Region to Region. The climate of India is interesting and complex because India's topography is so diverse. India sees a wide range of weather conditions throughout the enormous continent, which ranges from desert plains, to mountains, to forests, to beaches. That being said, the climate ranges from equatorial to alpine. The temperatures can differ drastically from one region of the country to another. 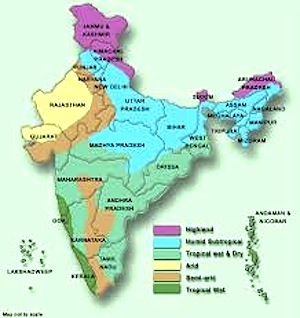 According to the Köppen system, a widely used system that determines an area's climate based on its vegetation, India has six primary climate types. India has desert in the western region, alpine tundra and some glaciers in the northern region, humid tropical regions that support rain-forests in the southwestern region, and its islands. Different regions have very different micro-climates as well. India has four basic seasons: winter in January and February, summer from March through May, monsoon season from June through September, and an after monsoon period from October through December. My wife and I were married in the western region, in the state of Gujarat, in December of 2007, during the post-monsoon period. A that time, the weather was warm and comfortable. I found the post monsoon season to be a good month to visit India. So, consider checking out an India destination in this season. The unique regional climate of India is directly influenced by its respective geology and geography. For example, the Himalayan Mountains in the north play the role of a barrier to the freezing katabatic winds that blow south through India from Central Asia. The Himalayas keep North India warmer, or at least only mildly cold during winter, and keep the same region fairly hot during the summer. India is considered a tropical country. Most tropical countries are somewhat unstable; India is no different. Monsoon storms, serious droughts, severe flooding, violent cyclones and other unpredictable natural disasters effect India. On the other hand, the weather is excellent in most regions, for most of the year. Just be certain that when you visit, you choose a region that is sensible for the time of year that you plan your trip. Here are some travel tip for traveling to India. Leave climate of India to learn about India's land topography. Check out this physical map of India.